First off, HAPPY NEW YEAR, everyone. 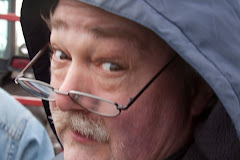 It is my hope, in the new year, to re-connect the songs lost in the divshare meltdown of early 2015, AND to return to posting more than three times a month. There's no telling what the new year will bring in terms of busy times and other complications, but it is my plan to do both of those things. 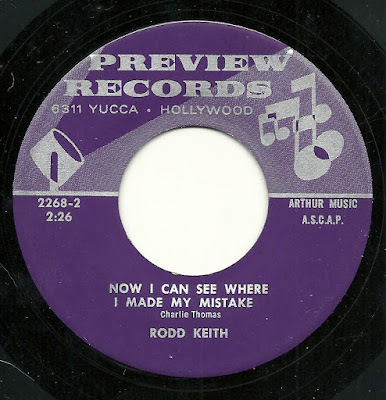 It has been a surprising three months since I last featured any Rodd Keith material, surely the longest time between such posts in the history of this blog. And so I found a late-era (for him) Preview release featuring a fairly interesting song on the b-side (not so much the flip, I don't think), and also one which features not one but two ridiculously long titles. In fact, in the "Rodd Keith" folder of my computer - which you might imagine is chock full and several screens long - these are the two longest song titles of the entire collection. Of the two, I much prefer "Now I Can See Where I Made My Mistake", a tune with a driving sound, pushed along by pulsating keyboards and steady drumming. To my ears, Rodd sounds like he's shooting for the sound of some of the blue-eyed soul belters who came to prominence in the late '60's and early '70's. I'm actually reminded, a little bit, of the beat and feel of "Suspicious Minds" (a record I really can't stand, by the way - I like this a lot more). While not an out-and-out winner, it's an interesting entry, and I like a lot of what's going on among the many elements of the track. 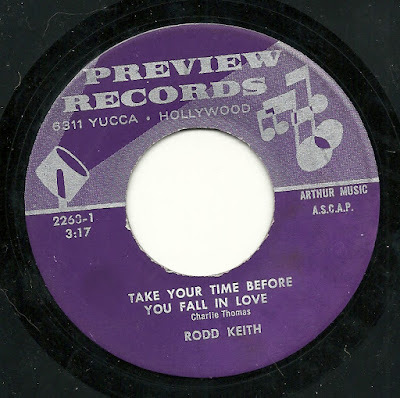 On the flip side is "Take Your Time Before You Fall in Love", by the same song-poet, who clearly liked to make his entire point via his song titles. This one is a slow drag - a bit too upbeat to be a ballad, but not nearly peppy enough to be a mover of any sort. For a too-long three and a quarter minutes, Rodd sings the writers story, which isn't a bad one, but which isn't told very well, musically or lyrically. Like so many other song-poems of this ilk, I lost interest halfway through, and had to go back to listen again to actually hear how we got to the point mentioned in the song title. First of all, let me wish all of you a happy Christmas, and/or joyful whatever else you're having. I appreciate every visitor and every visit to this site, and I hope you find it worth your while every time you stop by. 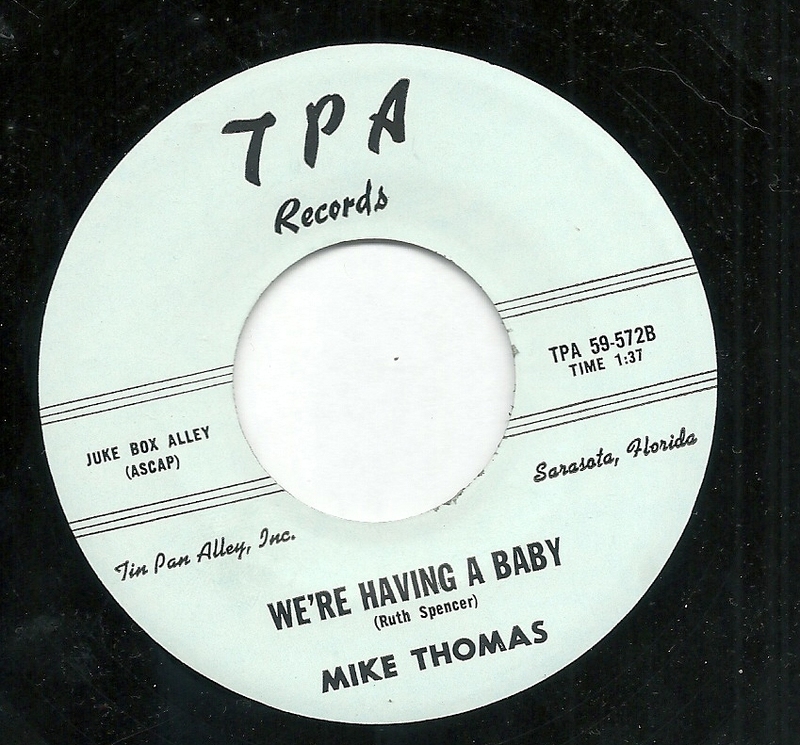 When I found I had a recent acquisition containing the song title "When a Baby is Born", I felt that was a natural for a Christmas Day post. However, the song, named in this week's post title, is by far the lesser of the two songs on this 45, so I'll share it in the runner-up position. 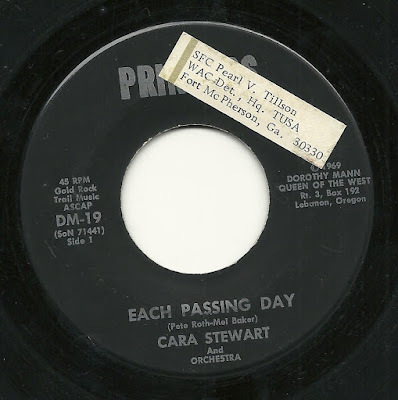 And it's no surprise that the flip side is better, as it is yet another winner from Cara Stewart, in this case titled "Each Passing Day". I suppose nothing really sets this one aside from other Cara efforts, just another wonderfully winning vocal and more arrangement magic from Lee Hudson. Actually the most interesting aspects of this record are probably the ones found on the label. When I shared the only other "Princess" label 45, in a post here (the links in that post no longer work), I speculated that the record in question was one of very few on the Princess label, a label not documented anywhere else at that time. 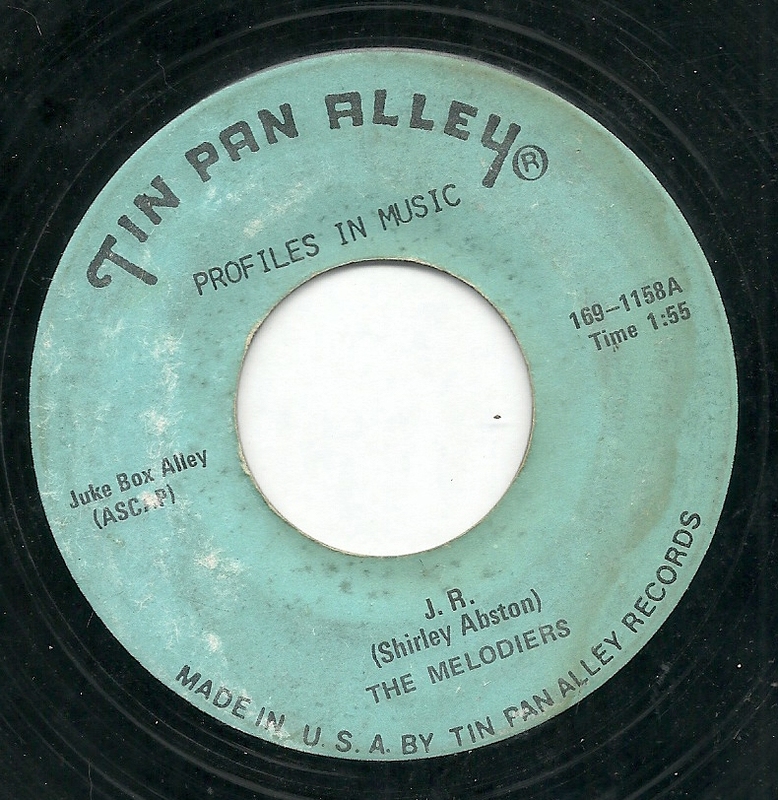 Clearly, there were more, as this record, from three years later (1969), is number 19, a whole six records after the 1966 issue linked above. Clearly these are rarities - it took me eight years to acquire a second Princess release. I didn't mention it in that previous post, but what is the deal with the copyright of "Dorothy Mann, Queen of the West"? That's got me thinking. And then of course, there is the matter of how and why did this come into the position of a Sergeant in the Women's Army Corps, as seen on the sticker. These are the things that would keep me up at night, if I was the sort to be kept up at night, which I'm not. Anyway, the flip side, "When a Baby is Born", may make for a good title to use on a post for Christmas Day, but as a song - even a song-poem, it's fairly awful. This slow, dull record doesn't even give me much of a clue as to what song-poem factory it may have come from. Thoughts on that? 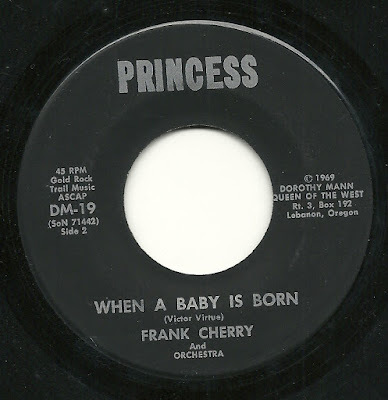 The record claims the singer is someone named "Frank Cherry", but a quick listen shows that this is very unlikely to be the case. At least, I'm not familiar with "Frank" being a unisex name, but maybe I'm just out of the loop. And finally, here is the Christmas card my family and I sent out to family and friends this year. 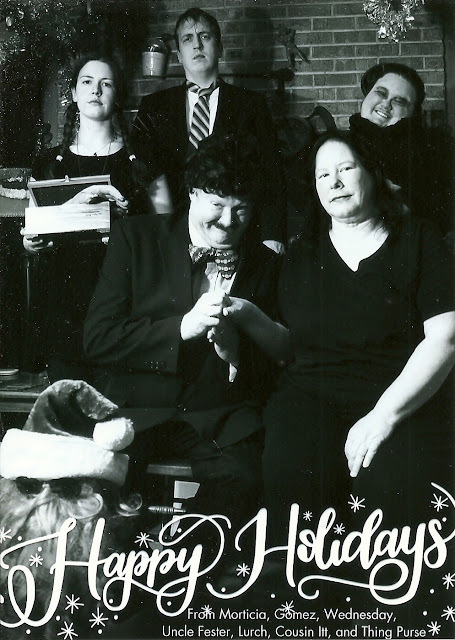 We have a history of offbeat Christmas cards, and my older daughter, who is an artist, had perhaps the best idea we've ever had for a card. My wife and I are in the front row (I'm actually bald - that's a wig), and our daughters are in the back, on either side of the boyfriend of my my younger daughter (who is on the left). 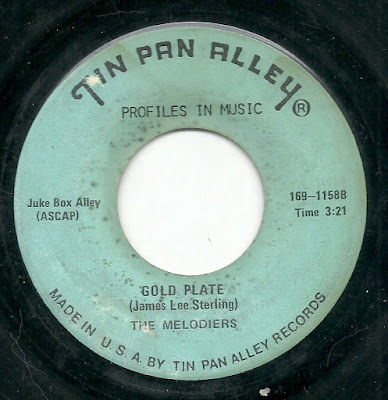 I know it's been a nearly unprecedented 17 days since I last posted here, and to make up for it, I'm going to offer up a two-fer, TWO Tin Pan Alley records, from several years apart, each of which contains a remarkable, entertaining and unique song on one side of the record. 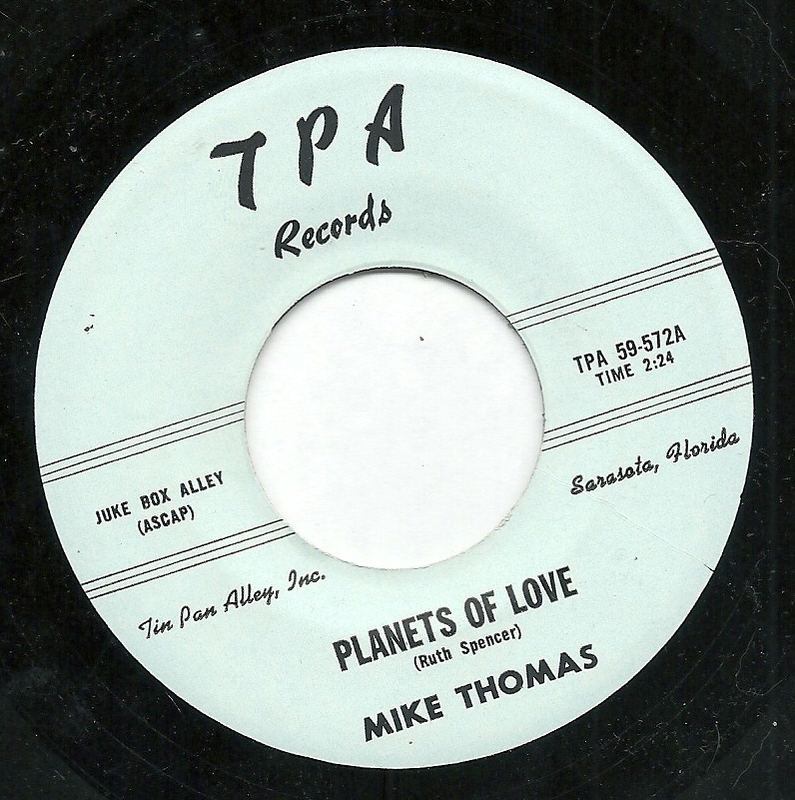 First up, a record by Mike Thomas with the minimalist house combo that accompanied so many of the tunes he warbled. As I so often do, I really must allow you to enjoy the bizarre charms of "We're Having a Baby", without giving away too much of what goes on in its 98 seconds of existence. Suffice it to say that the weird lines come nearly back to back to back, throughout the ultra-short song. And the bouncy musical bed is just icing on the cake. The fact that this record was pressed just a tiny bit off center just adds to the wooziness that the words create. I really wonder if the people in the Tin Pan Alley studio just completely lost it, cracking up, after finishing some of these records. The flip side, written by the same song-poet, is pressed even more off center. In this case, the song is of little interest to me, and the off-center effect is nothing but further annoyance. The song, "Planets of Love", is a stultifying slow 6/8 thing, of a type that Tin Pan Alley specialized in. It's genuinely difficult for me to remain focused on the lyrics long enough to care what he's singing about. Something about a marriage proposal underneath the moonlight, I think, but what's with the lyrics about all the evil things we do? "Dallas" was certainly a smash hit, and a TV phenomenon. Lead character J. R. Ewing inspired a few novelty records, including one that made Billboard's Hot 100. So it's little surprise that at least one song-poet decided to pen a tribute to the dastardly man. And again, it ended up with our friends at Tin Pan Alley. At this point, the house band was called "The Melodiers", although they sound to me like the same band, with Mike Thomas still on lead vocal. They put together a peppy, power pop like track, with a melody sung rapidly enough that I can't make out everything that's being sung, but it's catchy and fun (and would be even more so if not for the truly crappy condition of this record...). 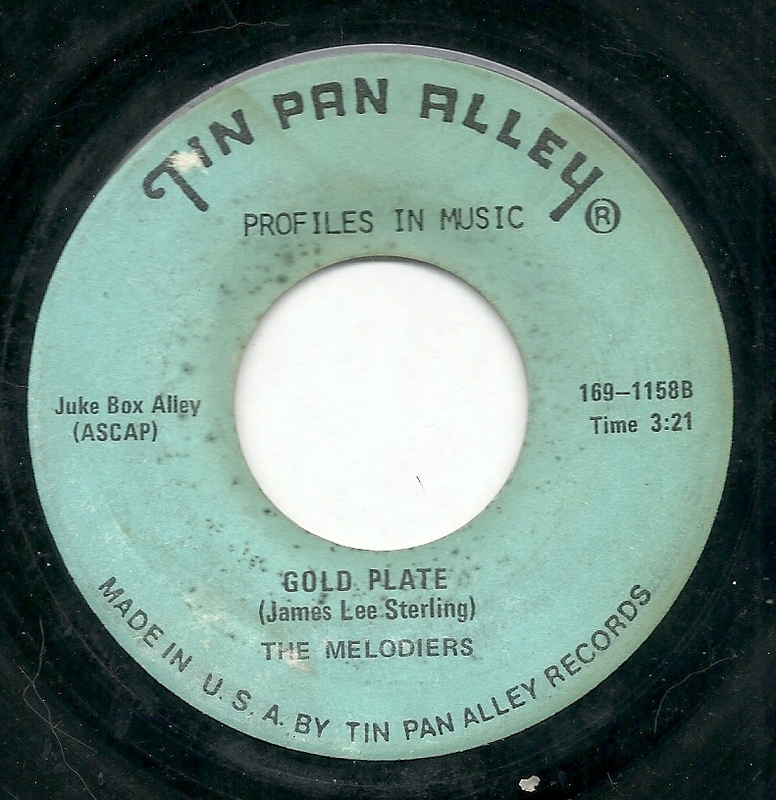 Download: The Melodiers - J. R.
The flip side is "Gold Plate", and one could be forgiven for thinking it's a remake of "Planets of Love" (above) at first. It has that same, thuddish 6/8 beat, and in this case, I really have no idea what the writer is on about. The singer (Mike Thomas or whoever), seems to have some insight, as he puts far more feeling into the last few lines than I could imagine someone directing at this song, after three minutes of boredom.